If you are a facilities manager, you may view the sale of energy credits as a potential ‘reward’ for achieving savings through energy efficiencies. 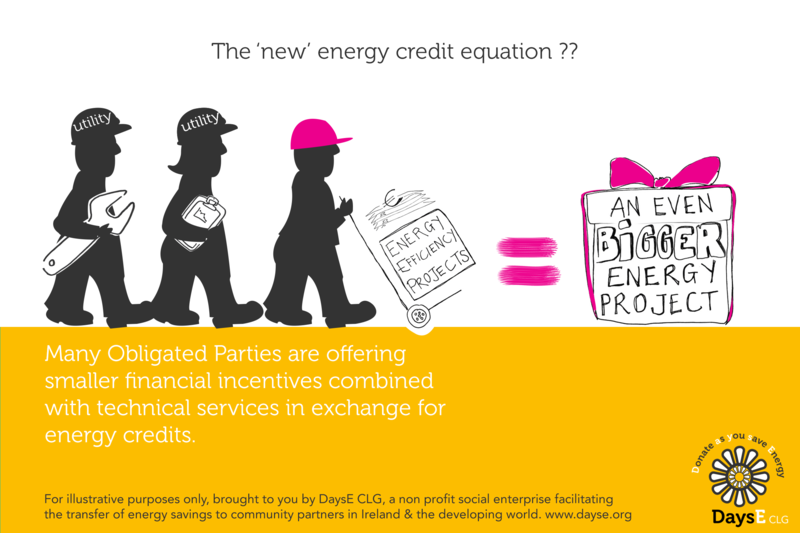 If you are one of the 11 of Ireland’s large energy suppliers/distributors or Obligated Parties (more later), you are likely to view the purchase of energy credits as one method of fine or penalty avoidance. Here at DaysE CLG we view them as one of many ways that our commercial clients can support energy projects in their communities and in the Developing World. As well as meeting important Corporate Social Responsibilities, energy credits can be a way of giving at ‘no additional cost’ to the company. This post aims to demystify energy credits by giving a high level overview of a complex topic. So what are Energy Credits? Energy credits are energy saving certificates that are issued under the National Energy Efficiency Obligation Scheme (EEOS). This scheme, mandated in the EU energy efficiency directive, places obligations on energy suppliers and distributors, ‘Obligated Parties’ (OP), to deliver energy savings of 1.5% of their total energy sales. 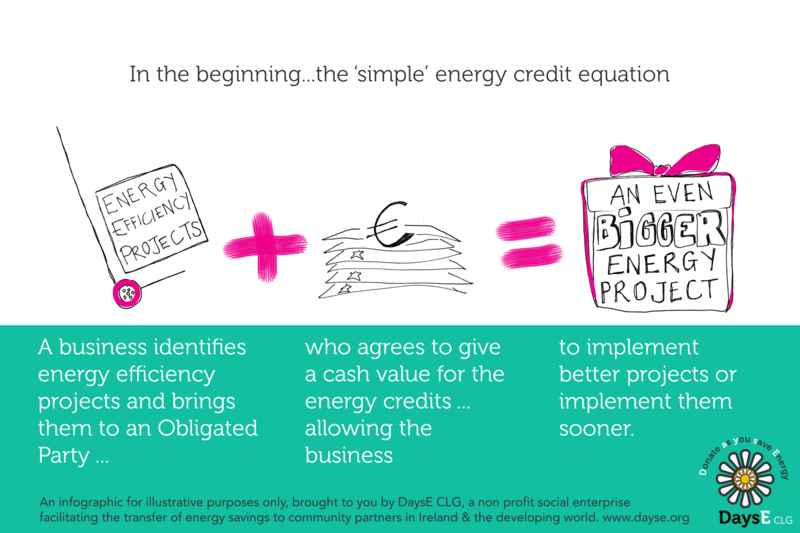 Every unit of energy saved by a project in conjunction with an OP has the potential to be reported as an energy credit. These can be domestic or non domestic. If an OP fails to secure sufficient credits, they can trade or buy-out at a higher price than would be realised. Projects can be any energy efficiency measure which, in non-domestic settings, need to be verifiable*. The scheme is run by the Sustainable Energy Authority of Ireland (SEAI), and they request verification of savings and check those for accuracy. In some situations, energy credits may have a monetary value. However, to extract a cash value for your project we recommend that you do your homework carefully and well in advance of starting works. How is the cash value of Energy Credits determined? When considering the cash value of energy credits, it is safe to assume that their price is closely linked to the cost of ‘buyout’. But there are other factors at play also. These include the different approaches that the Obligated Parties are taking to reach targets. In the non-domestic sector, for example, some are focusing on their own energy customers and combining a smaller cash offer with in-house engineering services. To be assigned energy credits for use towards non-residential targets an Obligated Party must submit a Non-Residential Energy Credit (NREC) form to the SEAI showing they were material to making the project happen. The OP can buy the credits from the project owner at a price per verified kWh saving BUT only if this agreement is reached before the project commences. However, the energy credit landscape is changing. Some OPs achieve at least part of their energy efficiency targets through the provision of engineering services and project implementation. At DaysE we see this trend increasing but as the project owner it is you who are in control of your savings. What can you do now that you know about Energy Credits? If you are considering implementing energy efficiencies within your company you have several avenues for obtaining a cash or service value. Of course, at DaysE we naturally encourage you to consider the CSR value: A donation of energy credits to us supports energy efficiency projects in your community or the alleviation of energy poverty in the Developing World. And the choice of beneficiary is yours. *under the DaysE model we have a partner who provides verification at a discounted rate. This can of course be covered by the revenue generated through the credits. You make a contribution to your chosen beneficiary and you are not out of pocket. Contact us for details. SEAI have listed the Obligated Party contact details on their website, you could contact your current energy supplier or you could call us – we will do the rest. Remember to leave your options open by contacting either DaysE or an Obligated Party BEFORE you implement a project.